This apple pie is for people who appreciate a good crust and love a filling where the flavor of the apples really comes through. Combine the flour, sugar, salt and buttermilk powder in a food processor. Add butter (and shortening if using) and then pulse until mixture is mostly coarse, but with a few pea-size lumps. Add the water 2 tablespoons at a time, pulsing after each addition, until dough starts to come together. Empty onto a flat surface and push dough together into two compact balls. Wrap in plastic wrap and chill until ready to use. Roll out one round of dough and line a 9 ½ inch deep pie dish with it. Keep chilled while you prepare the filling. 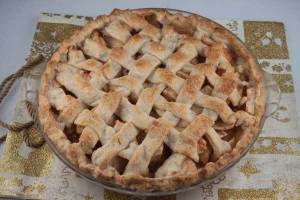 For the top crust, roll into another circle and place over the top, pinching ends and cutting vents as usual, or roll out and cut into strips to make lattice. Put a baking sheet on the lower rack to catch drips. Bake the pie on the rack above the baking sheet for 20 minutes at 425, then reduce heat to 350 and continue baking at 350 for 35 to 40 minutes or until crust is golden. If crust is browning too quickly, place a sheet of foil loosely over the top. Let cool before serving. I use SACO brand powdered milk. It's usually found in the baking aisle. For the butter, you can use a total of 8 oz (1 cup/2 sticks) of butter or use a combination of 1/2 cup butter (4 oz) and 1/2 cup shortening (3.4 oz).